If you’re a regular reader of this blog (and I understand that ‘regular’ is a bit of a stretch for a blog that takes entire years off at times), you’ll know that some angles are just sure-fire ways of getting yourself some media coverage. Sick of being nagged about the amount of time you take to get ready? Well new research shows that our partners may have a point. According to new research, women spend almost two years of their life doing their make-up. The recent study suggests that over a lifetime we spend an average of 722 days perfecting our health and beauty regimes – and all that prep doesn’t come cheap. The poll of 1,000 women, commissioned to mark the launch of Vaseline Spray Moisturiser, also revealed that one in ten women will spend up to two hours a day getting ready. “But a sprayable moisturiser!”, I hear you cry, “That’s going to save me LOADS of time!” Or at least that’s pretty much what Vaseline hope you to think, at some level, when you read this story. It is literally the only reason that this story exists: to highlight to you a problem in your life, and then present to you the solution. The poll, conducted by Superdrug for the launch of its new Make Up Academy range, revealed that the average woman spends nearly 20 minutes a day perfecting their look – a total of 330 days over her lifetime. It will come as no surprise to the women who despair at the rising cost of cosmetics. With their clever marketing ploys and promises of youth, big beauty firms have women in their grip. And as a new study shows, this addiction to cosmetics does not come cheap. Figures reveal that women fork out a staggering £100,000 on cosmetics over their a lifetime, according to a new study. Where did that additional £91,000 come from? Even accepting that not all beauty products are in the make-up category, that’s still a hell of a lot of toner and shaving wax. Though it didn’t stop the Daily Mail running a second article on the same claim by Bionsen, a fortnight later. Most men think women take too long getting ready and now they may have the proof. The average British woman devotes 91 hours a year to applying their make-up – that is 43 weeks a lifetime perfecting her face. Women in the south typically take longer to prepare for nights out and dates than those in the north, with 12 per cent spending 45 minutes to one hour each day. It’s been said women take a lifetime getting ready and it has now been revealed the average British woman will spend over a year of her life putting on her make-up. A new survey into women’s daily beauty regimes shows UK women spend a colossal 474 days – one year and three months – in their lifetime putting on cosmetics, the equivalent of over a whole week every year. Women mislay so much makeup they spend a staggering £15,872 replacing it during their lifetime, according to a new study. The research found losing expensive cosmetics now costs the typical British woman £248 a year. Those who do their makeup on the morning commute are some of the worst hit, with one in three leaving some on public transport. 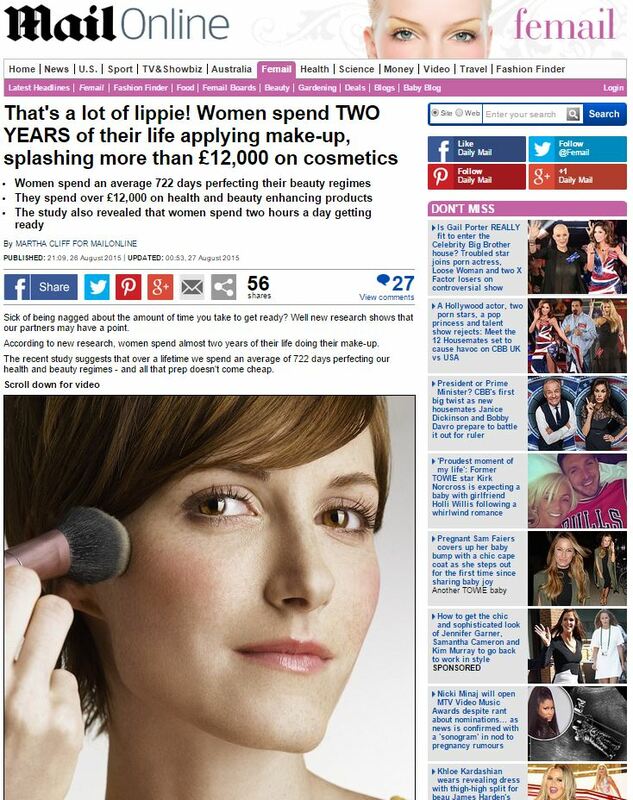 Back in March 2010 women were only spending £9,000 on make-up in their lifetime, but by May 2013 they’re spending almost double that amount on make-up that never gets fully used? What a nightmare. I mean, it’s bad enough that women are shedding expensive make-up items left, right and centre, but it’s a further kick in the teeth that the ones most heavily hit are those who try to claw back a few precious minutes from the make-up abyss by multitasking their cosmetic routine with their commute. From anti-ageing moisturisers to blemish-hiding foundations and lash extending mascaras – it costs money to look good. And now the price of beauty has been calculated in a study that has found the average woman will spend more than £18,000 on her face in her lifetime. Either women’s make-up consumption had doubled between 2010 and 2013, perhaps to keep in line with the apparent exponential growth in the time they spend applying it, or Superdrug must be pretty embarrassed to have originally underestimated their market by such a huge margin. If anyone ought to know how much money there is in the cosmetics market, it should be them. Still, we finally have entirely-accurate figures at least – a point which the Daily Mail celebrated by running the exact same story again, a fortnight later. The average woman will spend more of her life wearing make-up than not, according to a new report yesterday. In a typical day, women will have a face full of cosmetics for nearly 13 hours a day and will have just 11 hours free from it. Researchers surveyed a total of 2,000 women in a detailed study about women’s make-up habits and beauty routines. The poll by health and wellbeing brand Beurer found the typical woman puts on her ‘face’ at precisely 8am and spends 11 minutes applying it. The research discovered that the average women will spend £121 on cosmetics in a typical year and has around 13 items in her make-up bag. Stick with me, as there’s a bit of maths to do here: if we roughly estimate that women wear make-up from the age of around 16 and continue to do so all the way up to the end of her life expectancy at 71, we can see that £121 per year is around £6,700 across a lifetime. Equally, 11 minutes spent applying each day works out at a little over 153 days. Crude estimates, of course, but it’s clear that Beurer’s extensive and entirely-respectable research comes in way, way below the figures we’ve seen thus far. Ever wondered just how much we spend on make-up over our lifetime, or how much star power really affects the way we shop? A new infographic reveals just that, showcasing a collection of research from dozens of British surveys into women’s and men’s grooming habits. This one is a truly staggering finding – not only does it dwarf the previous figure, but it raises all other make-up estimates by an order of magnitude. Our previous record was set by Bionsen in 2011, who estimated the cost of all cosmetic products at £100,000 – yet FeelUnique.com claim their £100,000 figure only includes make-up. That’s a staggering rise of over 1000% from Superdrug’s obviously-accurate and utterly-reliable £9,000 back in 2010. Clearly, 2014 was a golden age for the make-up industry, who could presumably expect to earn over three trillion pounds over the lifetimes of the 32.2m women in the UK. Strange, then, that the entire cosmetics industry (of which make-up represents a slice) was worth only £8.4 billion in 2013, according to the Cosmetic, Toiletry & Perfumery Association. Perhaps the CTPA foresaw the oncoming crash of the cosmetics industry, which presumably happened between July 2014 and August 2015 – or how else could we account for Vaseline finding women’s total lifetime make-up spending to be an eighth of of the 2014 ‘research’? And what has happened in women’s lives that mean, according to Vaseline, they spend almost five times as much time applying make-up as Beurer claimed they did in 2014? So, what have we learnt? Well, the next time you see a story in the paper revealing the shocking amounts of time and money women spend on cosmetics, you should bear in mind that the model in the picture isn’t the only part of the story that’s totally made up. This entry was posted in Beurer, Bionsen, FeelUnique.com, Specialist Make-up Services, St. Ives, Superdrug, Vaseline and tagged Beurer, Bionsen, daily mail, daily mail reporter, debra robson, deni kirkova, FeelUnique.com, kate randall, Leah Doherty, Linda Kelsey, Martha Cliff, onepoll, Rebecca Twomey, Robert Slade, Sara Wolverson, sarah sharp, Scarlett Russell, Specialist Make-up Services, st ives, superdrug, Vaseline on September 4, 2015 by Michael Marshall.